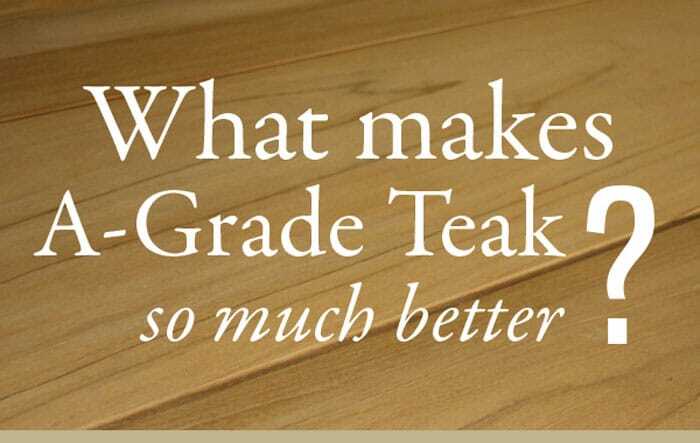 Why All The Fuss About A Grade Teak? 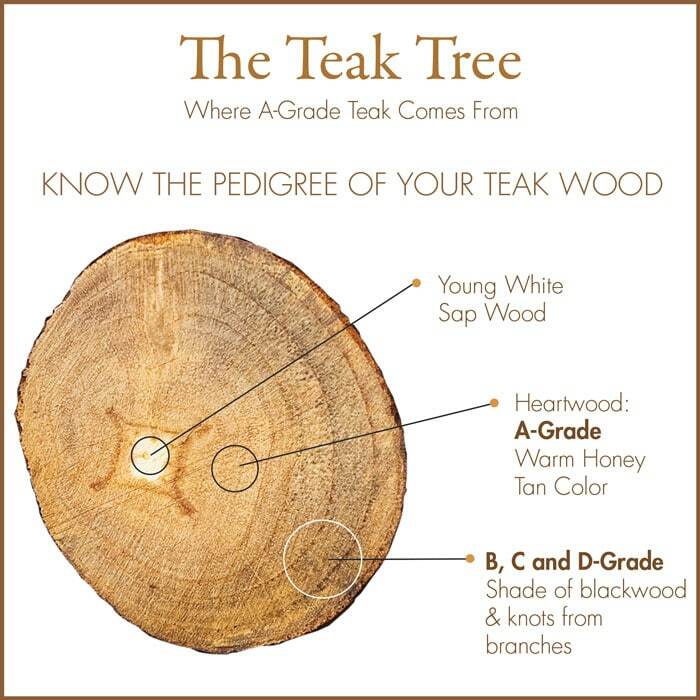 A-Grade Teak: Information and Why All The Fuss About A Grade Teak? The Quick answer is this: A Grade Teak is the premium center cut of the teak timber and makes up about 30-40% of the timber. It is cut from Teak trees 40 plus years old, and will not have discolorations, knots or variations common to lesser quality teak. The grain of this wood will be tight and even, the color will be consistent and warm with honey and golden wheat tones, and the compounds of the wood will be highly resistant to outdoor conditions, bugs and moisture retention. Teak wood is a hardwood that offers incredible benefits over other natural materials for use in outdoor furniture, due to the natural compounds that exist in the wood. Natural rubbers and oils help to protect this hardwood from UV damage, moisture and pest damage and help it to continue to look good many years after you put it into use. A-Grade teak (also called Grade-A; super Grade A or triple Grade-A) is a premium natural material for outdoor furniture because it offers the finest protection and incredible good looks. The natural tendency for A-Grade teak is to patina beautifully into a silvery-grey look, which develops over time in natural conditions including Sunlight and ambient moisture. The integrity of teak wood allows it to weather gracefully, but also maintain its integrity so as not to degrade like other, lesser grades of teak or other hardwoods and softwoods. A-Grade teak is incredibly uniform in color, finish and hardness. There is a very tiny allowance for knots or discoloration. More often than not with true A-Grade teak wood, such variations in wood grain don’t occur. A-Grade teak will have a naturally oily feel to it, and have a warm glow and an even color palette consisting of honey, wheat, gold, and amber. To further explain the lack of discoloration and knots in premium center cut A-Grade teak: Knots are remnants of branches. In old growth teak, the branches are much further away from the heartwood. Therefore: where a knot would have existed, there might only be a slight, linear, grain pattern variation and a line denoting the variation. There will not be the typical round knot in such center wood. In younger trees, these may manifest as true knots with a round shape, because there has not been enough development in the wood or enough heartwood to avoid knots and variations. True A-Grade teak is cut from mature trees and mature trees only. The A-Grade portion of the tree is the very heartwood of the tectona grandis tree. It represents the most difficult teak wood to source and is also, by far the most expensive. It can represent up to about 40% of the diameter of the tree, depending on the age of the tree; the younger the tree, the less A-grade teak that can be harvested. All trees grown in Indonesia are milled at around 40 years old. This allows for stable growth perfect for manufacturing outdoor furniture. It is very well-known in the timber industry – any trees that are significantly younger will be less stable. Additionally: Country of origin of the teak wood, is a pertinent question to ask your wood merchant or reseller. B-grade teak is a lower quality teak, with characteristically higher volume of color variation, inclusion of variances like knots and grain twisting, and a less dense grain. It is noticeably less consistent and dense than A-Grade teak. Often you might find color differences moving from occasional tan splashes, and large darker patches, coming together with large grey and black veins between them. B-Grade teak appears to mimic the same type of wild variation as other woods like olive wood. The pattern is not consistent, and the overall capabilities of the wood for use in outdoor furniture, from a performance perspective are obviously lessened. Often ashy and powdery residues can form on B-Grade teak, creating an awkward finish; these residues might be grey, white or black. B-Grade teak often has fillers, to compensate for knots that have fallen out or for inconsistencies in the wood grain. Fillers are obvious when the wood is examined up close. B and C grade woods come from the outer core of the tree where the wood is white and sappy or they are near the outer bark of the tree truck where there will be darker markings and more open grained wood. C-Grade and D Grade teak is usually reserved for use in trinkets from small villages near the forests where teak is cultivated. It is especially low quality teak and is often referred to as sapwood. It is not suitable for legitimate outdoor furniture usage. It has variances that are drastic; in color, figure, density and stability. Often this grade of teak wood is darker, such that it resembles an almost reddish or deep brown color and has inclusions that are undesirable both in integrity and from a visual perspective. Reclaimed teak by definition of the fact that it is not new manufacture A-Grade teak, cannot be classified as A-Grade, though that does not necessarily mean that the original selection was not from A-Grade stock. Reclaimed teak has grown in popularity of late. Why would I want machine made teak outdoor furniture? Often there is a concept and discussion that handmade products are superior to machine made products. Specifically in the Outdoor furniture market, this is NOT the case. Sure, we can all appreciate a very high end, custom piece of furniture, but those that offer such craftsmanship cannot offer consistency throughout many product lines and products. These one-off custom pieces are often many thousands of dollars as well. Machine milling and using computer controlled tooling is essential to creating the tight construction quality and accurate dimensions that make for long-lasting and beautiful pieces of outdoor furniture. For those who are familiar with teak wood products, you might also be aware that there is a trend for anything not machine-crafted, to be made from lower quality teak. Such lower quality pieces are not built to be used in varying conditions and certainly are not up to par in the quality of our manufacturing and standards of teak furniture made the way we have produced thousands of pieces of furniture over many years. We use machinery to produce the cuts, angles, joinery and planed surfaces of our A-Grade teak. When we have produced a perfect product, we then pass that along to our master craftsmen to build and finish the product into a stunning piece of furniture you see when you buy our outdoor furniture. It is this hand crafting that shows the quality of a true master craftsperson. Otherwise, generally speaking: “handmade” teak furniture is usually not quality. What is kiln drying and why does it matter with Teak? Kiln drying removes excess moisture to ensure that dimensions and weight, uniformity and consistency of the timber is all within a tight range of deviation. This means you get a product with accurate dimensions; a beautiful and consistent looking product, and one which showcases the best qualities that teak has to offer. Our oven kiln drying occurs before the final dimension/shaping production on teak timbers to ensure that any shrinkage and moisture variance issues are controlled. Additionally, it helps the wood to avoid warping and cracking. We kiln dry our wood in kiln ovens which are measured to result in approximately an 8% moisture content. The wood is then tested for moisture content again before construction to approximately a 10 to 12% moisture content, you won’t have moisture issues with the wood and you’ll be receiving the best quality teak available. The computer controlled tooling we use on our furniture will be able to achieve the most accurate dimensions and our master craftsmen will be able to produce the finest finish. Why is it important to source teak from certain sources? Teak is a valuable hardwood, with a lot of varied uses. What’s most important for the purposes of A-Grade teak and Outdoor Furniture use, is the plantation standards, the history of the production and the sustainability of such practices. Only from the best plantations and sustainability practices, can you yield the best product. We use wood sourced from Javanese plantations in Indonesia, under the control of the Indonesian government called the Perum Perhutani. The Javanese teak plantations are centuries old plantation tracts, with mature, old growth teak trees being harvested for timbers. The Dutch, in the colonial environment around the 1840’s, originally planted the forests; the reforestation effort is very responsibly and thoughtfully planned out. The Indonesian Government is very strict in controlling the output of these plantations and they impose very strict requirements to be able to bid on such fine teak wood. There is no other growth/production center of teak for commercial consumption that produces a finer timber than these forests. And most importantly the high restrictions and regulations for felling of trees is so incredibly important to our global environment. Recently, other countries in suitable climates have begun to grow tectona grandis, but the quality is lacking comparatively, as the trees are milled at a younger age. The tendency outside of Indonesia, is for agencies to approve the cutting down of young trees, unsuitable for high grade timbers. This is evident in the cut rate pricing and the inferior quality of the wood. Generally speaking, manufacturers willing to produce teak outdoor furniture from lesser quality teak are likely to produce an inferior product by design as well. Is there anything else like Teak Wood? If you want a natural product and desire the wonderful benefits showcased above, then no, you won’t be able to find a hardwood with the same benefits, the gorgeous look of teak or the longevity of premium center cut A-Grade teak. It is truly in a class of its own. You can find capable Synthetic materials when it comes to outdoor performance (like weather resistance and UV resistance), but it’s not a natural product like teak wood. Also, you can find beautiful hardwoods that aren’t teak, but you will not get the low maintenance of teak wood or the longevity of A-Grade teak. Teak is a perfect wood for outdoor furniture because it looks amazing and it weathers incredibly well, has durability and good looks and has an impeccable track record of performance over time. Teak has been the preferred material for yacht decks and furniture, outdoor furniture (like park benches and landmarks) and specialty installations because there isn’t another wood that offers so many wide-ranging benefits or looks as good doing it. A-Grade teak is the highest quality version of teakwood, it represents the absolute pinnacle of teak wood specimens. TIP: Beware of furniture merchants selling teak outdoor furniture with a finish. Always purchase teak furniture with no finish, so you can see what you are buying.